The drinking water industry relies on Standard Proportional-Integral-Derivative (PID) control for conveyance, which has a limited ability to simultaneously control multivariable inputs and outputs. Due to this control approach, water pressure fluctuates during water pump starts and stops, which makes utility infrastructure vulnerable to damage, as significant variations in pressure can lead to watermain breaks. The Windsor Utilities Commission (WUC) set out to find a more efficient control methodology that could counteract these pressure deviations, reducing damage to the system and ultimately providing end users with consistent water flow and pressure. Through a collaborative research and development project with Rockwell Automation, WUC concluded that Model Predictive Control (MPC) technology was ideal for these purposes. 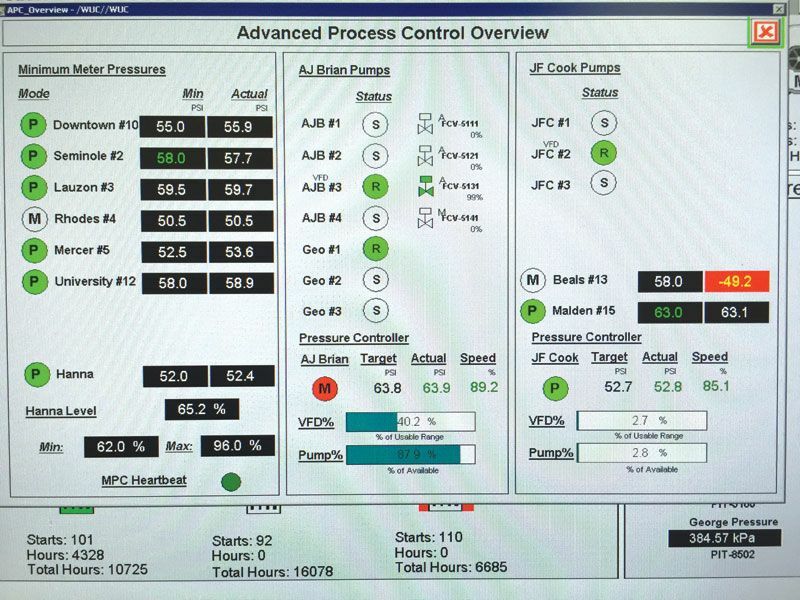 WUC began beta testing a new onboard MPC controller for Rockwell, which was applied to its high-lift pumping control strategy; this was the first use of this product across any industry. “Our utility was addressing inconsistency of supply pressure in varying areas within our distribution system,” said Garry Rossi, director of water production at EnWin Utilities. The MPC controller was extremely successful; its “exceptionally quick response time” of half a second allows WUC to “enable controls that virtually eliminate pump start and stop pressure fluctuations, one of the major causes of main breaks.” It is also very flexible and can be used in any SCADA control environment. The WUC’s main goals were to reduce overall pressure on the water distribution system by 1 psi, which would lower operational costs, as well as maintaining consistent pressure throughout the entire system and reducing watermain breaks, ultimately extending the life of their infrastructure assets. “It is always a challenge implementing changes that [have] a high potential [to affect] customer water quality,” Rossi said. Impressively, by installing the technology, WUC was able to successfully reduce main breaks by more than 20 per cent, saving approximately $125,000 in repairs. Rossi highlighted the significance of these kinds of savings in a country where many utilities have deteriorating infrastructure, increased repair and electricity costs, and system inconsistencies during periods of peak demand. “[There] is opportunity to become more efficient through the implementation of this technology, which in turn will improve chemical treatment and energy efficiency to produce and distribute the highest quality drinking water for future generations,” he said. By reducing main breaks, the technology will extend the life of water infrastructure and optimize water conveyance efficiency, and could be replicated in other communities. WUC is examining the possibility of applying MPC to other aspects of the water treatment process, including daily production management, chemical dosing and filter backwash cycles.